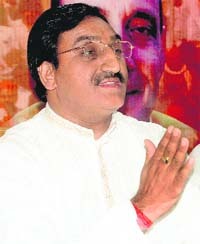 Reacting sharply to the accusations made by former minister and senior Congress leader Indira Hariydesh regarding the non-utilisation of the Central funds by the Uttarakhand government, state minister for health and BJP spokesman Ramesh Pokhriyal ‘Nishank’ today said the Congress was “misleading” people by levelling false allegations. Congress election incharge for Uttarakhand and Rajya Sabha MP Viplove Thakur today asserted that the party is in a strong position in the state and would emerge victorious in all the five constituencies. With Uttarakhand assembly Speaker Harbans Kapoor accepting the resignation of estranged BJP legislator from Vikasnagar, Munna Singh Chauhan, decks are cleared for his entry into the Bahujan Samaj Party. A massive thunderstorm hit Doon in the evening today, throwing life out of gear. The impact of the thunderstorm was so much that many trees were uprooted at several places in and around Dehradun. The thunderstorm was followed by moderate rainfall. The agitation by the Haridwar municipal committee workers against the alleged manhandling of executive engineer (EO) Harshwardhan Mishra by the opposition councillors on April 2 over the Mansa Devi ropeway fare continued despite the additional secretary holding two rounds of talks with them. The Tamil Nadu Handicrafts Development Corporation (TNHDC) has organised a ‘Craft Mela’ under the brand name “Poompuhar”. The fair that began yesterday will conclude on April 13, and on display are a wide variety of traditional items from Tamil Nadu, which are attracting crowds in huge numbers. At a time when neighbouring countries like Pakistan, Bangladesh and Nepal are facing a threat to their democracy, the media in India has vast freedom and that should be used to strengthen democracy. Cadets of the RIMC here did social work at Manglori village from March 29 to April 2 during the mid-term break. Manglori, a small village in Garhwal hills, has been adopted by the Rashtriya Indian Military College (RIMC). Though politicians manage sports federations and use it to showcase their political status, a politician in Haridwar is inspiring bodybuilders by example. Laksar legislator Kunwar Pranav Singh alias Champion was the chief guest at a bodybuilding charity show. (Left) Bodybuilders at the Kishore Jatav Memorial Charity Bodybuilding Show in Haridwar. (Right) MLA Kunwar Pranav Singh 'Champion' flexes his muscles at the show. The District Football Association’s elections, which concluded recently, have received few accolades from various football clubs of the city. These clubs are seeking that elections be held annually rather than once in four years which has been the practice. 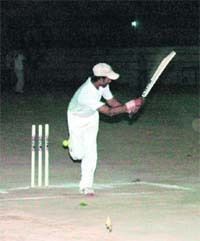 Raipur XI and SBS (PG) Institute on Saturday won their matches at the day-night Kalanga Cricket Tournament at Tapowan here. In the first match, SBS (PG) College beat No Mercy Club by 48 runs. Batting first, SBS (PG) College piled up a massive total of 179 runs in their allotted 15 overs. Opening batsman Nitin was the star performer hitting 99 runs off 46 balls. He smashed six fours and 10 sixes. Adarsh contributed 39 runs off 19 balls hitting three fours and three sixes. Nishank claimed that they had not received funds amounting to Rs 18,000 crore under the special package for Uttarakhand, as claimed by the Congress. “Besides, we have also not received Rs 4,000 crore under the Prime Minister Gram Sadak Yojna. It is shameful that Congress leaders have stooped to such a level that they are issuing completely misleading statements,” said Nishank. The minister also ridiculed the claim made by the Congress that credit of starting the 108 EMRI service in Uttarakhand goes to the UPA government. “It was Khanduri government that took the initiative to launch the 108 service and Congress is unnecessarily trying to take the credit. If the Congress was so much interested in the service, why was it not started during their tenure,” he said. Taking a dig at the UPA government on the issue of sky-rocketing prices of essential commodities, Nishank said prices of pulses, sugar, kerosene, flour etc have almost doubled than what it was during the NDA regime. “By saying that Congress hand is with the common man, they are rubbing salt on the wounds of the general public. The Congress is only interested in catering to the rich, mighty and corrupt. “If they were concerned about the common man, they would not have allowed the prices to shoot up,” added Nishank. He accused the Congress of exploiting Uttarakhand economically, socially and politically. “The reduction of the industrial package, given to Uttarakhand by NDA government, by three years, is a glaring example of the step-motherly treatment meted out to the state by the Manmohan Singh government,” he said. Nishank also flayed the UPA government on the issue of non-initiation of the work of AIIMS in Rishikesh. He said that NDA regime had sanctioned the project at the cost of Rs 600 crore, but the ND Tiwari government did nothing in this regard during their five-year tenure. While claiming that people are extremely happy with the five-year rule of the UPA government, Thakur said "good governance" of the Congress-led Central government will be one of the main election issues. Terming the policies of the Khanduri government as "detrimental" for progress of the state, Thakur said: "Congress is concerned about the welfare of all sections and UPA's report card clearly reflects this." After convening a meeting with leaders of Tehri constituency at the Congress headquarters, Thakur said, "The main objective of my visit is to meet leaders and chalk out strategy for the elections." 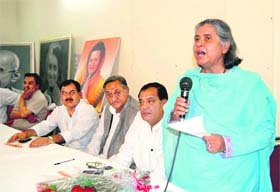 Thakur said the Congress rank and file is united in Uttarakhand and geared up for the elections. "I have conveyed to the party men that winning all the five seats should be the target," she said, adding that she would also be convening meetings with leaders at Haridwar and other parliamentary constituencies of the state. The incharge of Mahila Congress affairs in Uttarakhand Shikha Kapoor also convened a meeting with the activists today. During the deliberations, Kapoor instructed the women Congress members to wholeheartedly work for the victory of the party candidates. Meanwhile, BJP Women Wing national general secretary Jayaben Thakkar lashed out at the UPA government saying, "Manmohan Singh government has completely failed to ensure internal security in the country". She also criticised the UPA government for being non-serious on the women reservation bill. "BJP is in favour of women empowerment and if voted to power, passing the bill will be the top priority of out government," she claimed. Munna submitted his resignation to the Speaker on April 2, the day he resigned from the BJP. The BJP leadership made all efforts to stop him from leaving the party, but in vain. After his resignation, Munna said he had felt suffocated in the BJP. A day later on April 3, BSP leaders in Dehradun announced holding a function, to welcome Munna into the party fold. The function was cancelled when the Speaker did not accept Munna’s resignation. Even after Munna’s statement to the media regarding his resignation from the BJP, the party leaders had maintained that they had not received Munna’s letter. On parliamentary affairs and tourism minister Parkash Pant’s claim that they had not received Munna’s resignation, the latter said he had sent his resignation to the party and had also publicly announced his departure from the BJP. Speaking to mediapersons here this afternoon, Speaker Harbans Kapoor said he had received the legislator’s resignation on April 2. “At around 11.55 am today, I accepted Munna’s resignation. He is no longer the legislator of the Uttarakhand Assembly and his seat stands vacant,” he said. With the acceptance of Munna’s resignation, it is almost certain that Munna will join the BSP and is likely to contest from the Tehri parliamentary constituency. A massive thunderstorm hit Doon in the evening today, throwing life out of gear. The impact of the thunderstorm was so much that many trees were uprooted at several places in and around Dehradun. The thunderstorm was followed by moderate rainfall. Immediately after the storm hit at around 7.30 pm, power went off in almost all the city areas. By the time of filing this report, no loss of life or major loss of property was reported. Dr Anand Sharma, director, meteorological department, Uttarakhand, said the thunderstorm has been caused by a western disturbance. “The strong winds, which later converted into thunderstorm, were dusty and with no moisture content. “The nature of the winds was updraft and downdraft,” he said. Dr Sharma added that first the thunderstorm hit Dehradun and after sometime reached Rishikesh as well. He informed that in the next 24 hours, rainfall and squall is expected in Dehradun and other parts of the state. The 108 EMRI emergency ambulance service and police department officials said despite poor visibility and the intensity of the thunderstorm, they had received no cases of accident. A slight division appeared in the workers union when a union, the Uttaranchal Pradeshiya Safai Majdoor (UPSM), distanced itself from the ongoing strike but as other unions are still on strike, the work of the municipality suffered. The ward members are under tremendous pressure as the unions are asking for their resignation as well as strict punishment for their behaviour. Additional secretary Vijay Kumar Dhoundiyal held two rounds of meetings with the union representatives in the presence of the chairman and EO but nothing substantial came out of the meeting as the union members were adamant on their demands. They are demanding a public apology from the councillors to their EO Harshwardhan Mishra. On April 2, the ninth day of the stir by ward members over the hike in ropeway fares to Mansa Devi temple, the ward members allegedly misbehaved with the EO, his family members and then took the EO by force from his house to the ropeway company. They then made him “seize” the gates of the ropeway company, created commotion at the company office and didn’t pay heed to the city magistrate’s and the police’s advice. 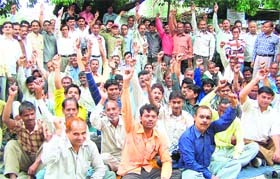 When palika workers came to know about the incident, they went on strike. Seeing the municipality union’s stance, ward members have suspended their agitation. Now, with one union distancing itself from the boycott, ward members are heaving a sigh of relief but are still not coming to municipal office. Meanwhile, the city is full of garbage heaps and with the summer approaching, mosquitoes and flies are thriving. Residents are angry at the whole episode as municipality works have been affected. Old timers term it as the worst and unproductive term by any municipality in Haridwar. The strike has hit the massive and slow work going on at the sewer line in the city and has added to the woes of the public. “Is there no authority to clean all this?” asked Anastasia Miskina, a member of the group. The Tamil Nadu Handicrafts Development Corporation (TNHDC) has organised a ‘Craft Mela’ under the brand name “Poompuhar”. The fair that began yesterday will conclude on April 13, and on display are a wide variety of traditional items from Tamil Nadu, which are attracting crowds in huge numbers. The Tamil Nadu Handicrafts Development Corporation Limited has been undertaking various steps to promote authentic handicraft of the state with an aim to market them better and generate employment for the craftsmen. “Our main motive is to help craftsmen get an access to markets as well as display our rich cultural heritage. “This is our first attempt in Dehradun and we are expecting a good response,” said V Hemlata, manager of the Corporation. On display are a variety of artefacts in bronze, brassware, stoneware, sandalwood and rosewood. These include lamps, wooden sculptures and wall brackets et al. The price range of items on display begins from Rs 10 to 2 lakh and above. Items with traditional wood carvings; bronze artifacts with rare motifs and expressions, brass lamps with engraved peacocks, parrots and swans are the highlight at the fair. “I loved the wooden sculptures of various deities; it is so finely crafted and beautiful,” said Alka, a housewife. As of now, the corporation has a network of 16 showrooms all over India and seven production centres set up to provide design inputs and production of rare objects and motifs, which are not normally crafted. “These pieces have been collected over a period of six months. “We strongly believe that such fairs are necessary for development of smallscale industries and artisans who are working hard to earn their livelihood,” added Hemlata. These were the views of Uttarakhand Assembly speaker Harbans Kapoor who was the chief guest at the oath-taking ceremony of the Press Club here. He urged the media to act as the fourth pillar of democracy and be the shield of Indian democracy. The Speaker said that the masses were made aware of the freedom struggle by journalists before India’s independence. “Ganesh Shankar Vidyarthi, Santi Swaroop, Bharatendu Harish Chandra, Bal Gangadhar Tilak, Mahatma Gandhi and Jawaharlal Nehru had used their pen to guide the nation. Journalism was highly respected during those times,” said Kapoor. He also stressed on the need for senior journalists to guide the newer lot specially on the need to withhold the high standards of journalism and the need to be neutral. Acharya Dr Vishnu Dutt Rakesh cited Swami Shraddhanand’s example as an ideal in the field of journalism and said that new avenues should be explored by journalists. On the present election scenario, senior journalist Kishore Malviya urged the journalistic fraternity to remain neutral in their reporting. Oath was administered to newly elected president of the club Rakesh Walia, general secretary Ajit Dubey, executive members Subash Kashyap, Sashi Sharma, Santosh Kashyap, Swami Sureshwaranand Saraswati, Anil Khurana, Anil Arora, Swami Sharad Puri and Furkan Ali. Cadets of the RIMC here did social work at Manglori village from March 29 to April 2 during the mid-term break. Manglori, a small village in Garhwal hills, has been adopted by the Rashtriya Indian Military College (RIMC). Twice a year, cadets of Class XI of RIMC endure a 20-km uphill trek in the wild to reach the village. The route includes the Nag Devta temple devoted to the serpent deity. As many as 22 cadets of the 168th course of the RIMC accompanied by PK Jain and Vineet Mathews visited the village. They did social service and interacted with schoolchildren and taught them a few gymnastic tricks. They performed a cultural programme and entertained the villagers. During their stay, the cadets helped in repairing the school building and clearing the litter. In return, the grateful villagers narrated stories and told the cadets about their customs and traditions. The cadets will visit the villagers again in September. Though politicians manage sports federations and use it to showcase their political status, a politician in Haridwar is inspiring bodybuilders by example. Laksar legislator Kunwar Pranav Singh alias Champion was the chief guest at a bodybuilding charity show. The show, which was held in memory of Kishore Jatav, saw the participation of bodybuilders from all over the district. Sunil Kumar, Amit Kumar, Rajeev Rathi, Vikas Bharadwaj, Ashwini Kushwava, Sachin Aneja, Pramod Kumar, Harmeet among others participated in the event. The venue, Rotary Rangshala at Mayapur, was jam-packed and all participants kept the audience hooked with their well-toned bodies. Kunwar Pranav stressed on the need for a healthy body, especially in this age when technology and fast food has invaded the people’s lifestyle. “These shows will help generate interest among the youth towards maintaining their body. A healthy society can only emerge from healthy individuals. A healthy society will eventually lead to a healthy nation,” said Pranav. The legislator, known more for his physique, recently garnered attention in all leading dailies and media channels when he bared his muscles outside 24, Akbar Road, the Congress headquarters in Delhi. He was there to vie for Lok Sabha ticket from Haridwar constituency but had failed in the bid. The District Football Association’s elections, which concluded recently, have received few accolades from various football clubs of the city. These clubs are seeking that elections be held annually rather than once in four years which has been the practice. However, the association claims to be following the rules prescribed by All-India Football Association which has prescribed such elections only once in four years. A clash seems inevitable at the next general body meeting, which is scheduled in the near future, between the members of the association and the clubs. Formed in 2005, Dehradun Football Association (DFA) has been organising various football tournaments in the city. But the football clubs seem to be dissatisfied over the working of the association which they allege is not abiding by the rules itself. Sources said that for the elections, the association invites clubs with whom it has a liaison and ‘A’ division clubs that have a greater say in the election are not informed. This is purposely done to avoid any resistance during the elections. The association also helps their associates get elected to various posts, club members allege. However, secretary of the association, Devinder Bisht, denied all allegations. “We adhere to the rules of our national body to whom we are affiliated. The association had conducted the election of the district body last year and had invited all clubs. But most of them did not participate in the elections. Bisht was annoyed at the way the whole matter was being blown out of proportion by the clubs. “We have been organising a football tournament in its true spirit in Dehradun and are running the association as per All-India Football Association’s guidelines. The guidelines clearly specify that association elections are to be held once in four years,” said Bisht. Raipur XI and SBS (PG) Institute on Saturday won their matches at the day-night Kalanga Cricket Tournament at Tapowan here. In the first match, SBS (PG) College beat No Mercy Club by 48 runs. Batting first, SBS (PG) College piled up a massive total of 179 runs in their allotted 15 overs. Opening batsman Nitin was the star performer hitting 99 runs off 46 balls. He smashed six fours and 10 sixes. Adarsh contributed 39 runs off 19 balls hitting three fours and three sixes. First-down batsman Sudhakar chipped in with 20 runs off 21 balls. For No Mercy Club, Rohit and Amit took one wicket each. Chasing 180 runs for victory, No Mercy Club were all out for 131 runs. No Mercy Club openers were off to a flying start. They contributed 23 runs in the first two overs. Opener Saurav hit 23 runs off 25 balls. Middle-order batsman Vipin smashed 32 runs off 17 balls hitting two fours and three sixes. No Mercy Club fell short by 48 runs. For SBS (PG) College, H Alam was the pick of the bowlers with three wickets in his three-over spell. In the second match played between Raipur XI and Kayjay XI, Raipur XI won by ten wickets. It proved to be a low-scoring game. Batting first, Kayjay XI was all out for 47 runs in 11 overs. It was a fine bowling display by Raipur bowlers. Amit was the only batsman to reach double figures. He made 10 runs off eight balls. Raipur XI bowlers picked up wickets at regular intervals. Suraj was the leading wicket-taker with three wickets in his three-over spell. Mathur and Deepak took two wickets each. Chasing the miniscule 48-run target, Raipur XI completed the formalities in seven overs. Raipur XI openers smashed Kayjay XI bowlers all around the ground to reach the target with eight wickets in hand. Opener Kedar smashed 31 runs off 17 balls. The other opener Mandeep smashed 19 runs off nine balls with four fours. For Kayjay XI, Suraj and Vishal took one wicket each.